I’m still around, but not knitting – still having trouble with the elbow. It’s better than it was, but I’m still having some pain. I go back to see the doc on Monday. Other than that, it’s just been too hot to think. Or blog. Whoa, at first I thought the blog title was, “Puppies” and I thought, no way, this is some kind of a joke…. Your Poppy is beautiful! I am sorry you are still having pain and I hope you feel better soon. I hope your elbow’s better soon – it’s been a while hasn’t it. Even if I move to Alaska, I am going to have AC in my house and car. Cuz, ugh. People still blog? I thought everyone’s brains had melted. 😀 Poppies! Hope your elbow feels better. My brain has certainly melted. Love the happy poppy! I hope you are feeling better. Your poppy is cheerful! 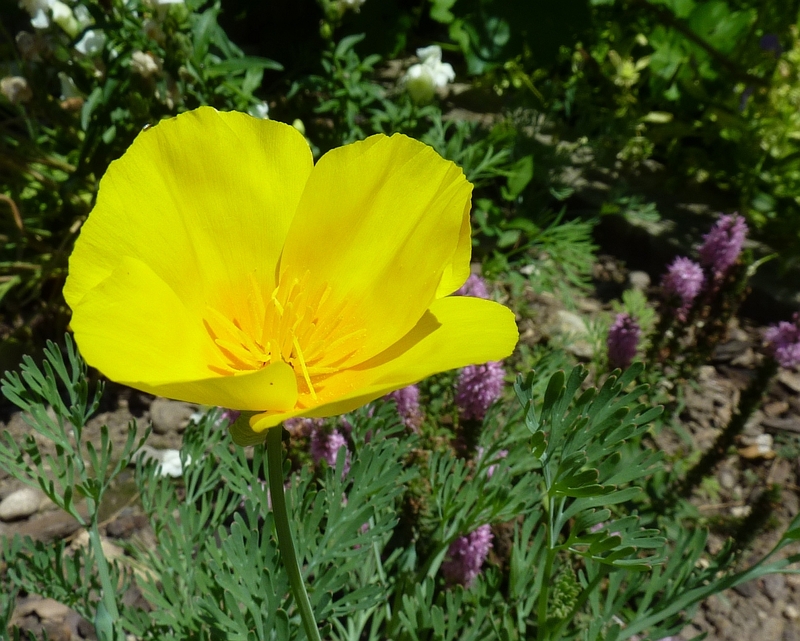 I bought poppies to plant in the yard, but the heat got to them before I did. No poppies for me!